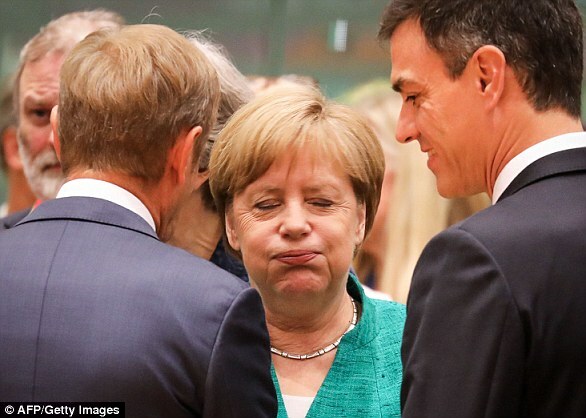 Donald Tusk has said he 'remains convinced that a compromise, good for all, is still possible' after Theresa May berated EU leaders following her humilation in Salzburg. Responding to a ferocious fightback from the Prime Minister earlier today, Mr Tusk said he only said her Chequers plan would not work because of her 'surprisingly tough and uncompromising' stance. 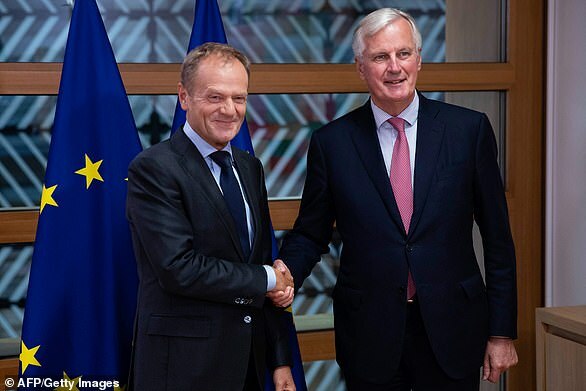 He said in a statement: 'The response of the EU27 leaders was to reiterate our trust in chief negotiator Michel Barnier and to reiterate our position on the integrity of the Single Market and the Irish backstop. His words come after a clearly livid Mrs May hit out at her counterparts for 'lacking respect' when they brutally rejetced her Chequers plan at this week's summit. 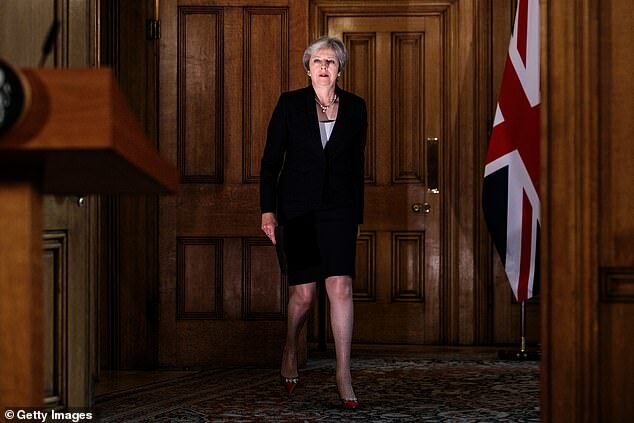 In a combative statement in Downing Street, she admitted that the two sides were still a 'long way apart' and at an 'impasse'. 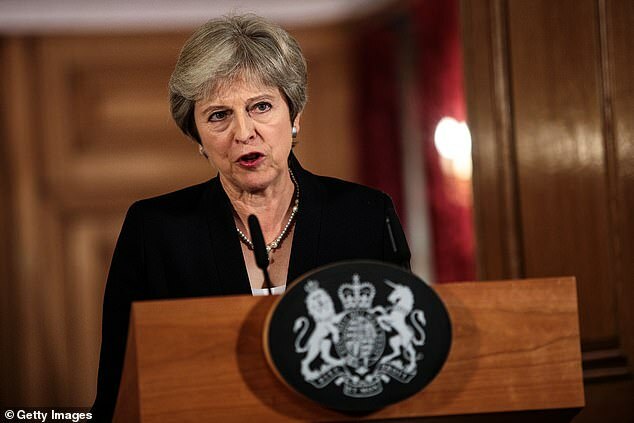 But she warned that the leaders were 'making a mistake' if they thought she would back down on her red lines, and said failure to compromise would poison relations completely. 'Throughout this process I have treated the EU with nothing other than respect. The UK expects the same. A good relationship at the end of this process depends on it,' she said. 'Yesterday, I was in Salzburg for talks with European leaders. 'I have always said that these negotiations would be tough - and they were always bound to be toughest in the final straight. 'While both sides want a deal, we have to face up to the fact that - despite the progress we have made - there are two big issues where we remain a long way apart. 'The first is our economic relationship after we have left. Here, the EU is still only offering us two options. 'The first option would involve the UK staying in the European Economic Area and a customs union with the EU. 'In plain English, this would mean we'd still have to abide by all the EU rules, uncontrolled immigration from the EU would continue and we couldn't do the trade deals we want with other countries. 'That would make a mockery of the referendum we had two years ago. 'The second option would be a basic free trade agreement for Great Britain that would introduce checks at the Great Britain/EU border. But even worse, Northern Ireland would effectively remain in the Customs Union and parts of the Single Market, permanently separated economically from the rest of the UK by a border down the Irish Sea. 'Parliament has already - unanimously - rejected this idea. 'Creating any form of customs border between Northern Ireland and the rest of the UK would not respect that Northern Ireland is an integral part of the United Kingdom, in line with the principle of consent, as set out clearly in the Belfast/Good Friday Agreement. 'It is something I will never agree to - indeed, in my judgement it is something no British Prime Minister would ever agree to. If the EU believe I will, they are making a fundamental mistake. 'Anything which fails to respect the referendum or which effectively divides our country in two would be a bad deal and I have always said no deal is better than a bad deal. 'But I have also been clear that the best outcome is for the UK to leave with a deal. That is why, following months of intensive work and detailed discussions, we proposed a third option for our future economic relationship, based on the frictionless trade in goods. That is the best way to protect jobs here and in the EU and to avoid a hard border between Ireland and Northern Ireland, while respecting the referendum result and the integrity of the United Kingdom. 'Yesterday Donald Tusk said our proposals would undermine the single market. He didn't explain how in any detail or make any counter-proposal. So we are at an impasse. 'The second issue is connected to the first. We both agree that the Withdrawal Agreement needs to include a backstop to ensure that if there's a delay in implementing our new relationship, there still won't be a hard border between Ireland and Northern Ireland. 'But the EU is proposing to achieve this by effectively keeping Northern Ireland in the Customs Union. 'As I have already said, that is unacceptable. We will never agree to it. It would mean breaking up our country. 'We will set out our alternative that preserves the integrity of the UK. And it will be in line with the commitments we made back in December - including the commitment that no new regulatory barriers should be created between Northern Ireland and the rest of the UK unless the Northern Ireland Executive and Assembly agree. 'As I told EU leaders, neither side should demand the unacceptable of the other. 'We cannot accept anything that threatens the integrity of our union, just as they cannot accept anything that threatens the integrity of theirs. 'We cannot accept anything that does not respect the result of the referendum, just as they cannot accept anything that is not in the interest of their citizens. 'Throughout this process, I have treated the EU with nothing but respect. The UK expects the same. A good relationship at the end of this process depends on it. 'At this late stage in the negotiations, it is not acceptable to simply reject the other side's proposals without a detailed explanation and counter proposals. 'So we now need to hear from the EU what the real issues are and what their alternative is so that we can discuss them. Until we do, we cannot make progress. 'In the meantime, we must and will continue the work of preparing ourselves for no deal. 'In particular, I want to clarify our approach to two issues. First, there are over 3 million EU citizens living in the UK who will be understandably worried about what the outcome of yesterday's summit means for their future. 'I want to be clear with you that even in the event of no deal your rights will be protected. You are our friends, our neighbours, our colleagues. We want you to stay. 'Second, I want to reassure the people of Northern Ireland that in the event of no deal we will do everything in our power to prevent a return to a hard border. 'Let me also say this. The referendum was the largest democratic exercise this country has ever undergone. To deny its legitimacy or frustrate its result threatens public trust in our democracy. 'That is why for over two years I have worked day and night to deliver a deal that sees the UK leave the EU. 'I have worked to bring people with me even when that has not always seemed possible. 'No one wants a good deal more than me. But the EU should be clear: I will not overturn the result of the referendum. Nor will I break up my country. 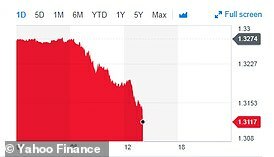 The Pound fell sharply as Mrs May delivered the angry retort, as markets assessed that the chances of 'no deal' have risen. She was condemned by Remainers and Labour - but Tory Brexiteers said she was right to stand her ground against Brussels. The premier did offer something of an olive branch by unilaterally guaranteeing the rights of around three million EU citizens already living in the UK. 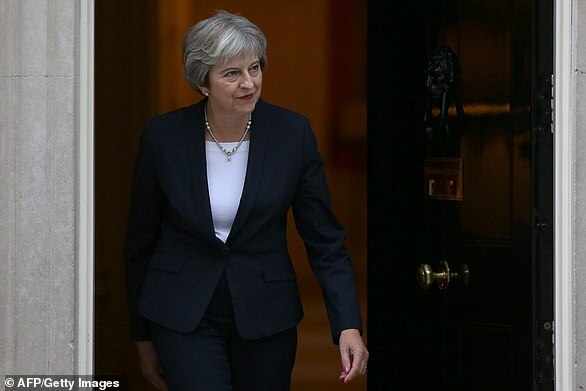 The high-stakes clashes with the EU have threatened to destabilise Mrs May further ahead of an explosive Tory conference in just 10 days' time, where she could face an all-out mutiny from Eurosceptics over the Chequers plan. Support for Mrs May's stance in the Cabinet is said to be weakening, with Home Secretary Sajid Javid and Aid Secretary Penny Mordaunt among those thought to be edging towards backing looser Canada-style links with the EU. There are signs that the EU recognises that the jibes could have gone too far, with EU commission president Jean-Claude Juncker saying the two sides have to be 'careful' about engaging with each other 'like two loving hedgehogs'. Irish PM Leo Varadkar also stressed that he still believed there will be a deal, and suggested that elements of Mrs May's Chequers plan could be included in a future trade package. In a statement designed to shore up her own political position as well as rebuking the EU, Mrs May accused the EU of offering the UK two 'unacceptable' options. She said one was join the EEA and accept free movement and all EU rules without having a say in making them. The other option was a looser Canada-style free trade agreement - but allowing Northern Ireland to stay within the bloc's customs jurisdiction. On the latter she said: 'It is something I will never agree to - indeed, in my judgement it is something no British Prime Minister would ever agree to. If the EU believe I will, they are making a fundamental mistake. Earlier, Brexit Secretary Dominic Raab lashed out at 'dark mutterings' in Brussels about 'Northern Ireland being the price Britain will have to pay' for leaving the bloc - a reference to demands for the province to stay under EU customs rules after Brexit. 'That is not going to happen,' he told the BBC's Politics Live. 'Not with this PM, and not with this parliament.' Mr Raab accused the EU of 'yanking up the handbrake' and leaving a 'serious question mark' about whether they were taking the talks seriously. 'We've been rebuffed on our plans without any coherent explanation as to why, there's these sort of rather dogmatic pleas to the single market unity but our plans were very carefully crafted around that,' he said. He added: 'We're going to hold our nerve, stay calm and keep negotiating in good faith. He said Mrs May was 'a very stoic, resilient character'. The British response reflected anger from both Brexiteers and Remainers at the sabre-rattling behaviour from leaders in Salzburg yesterday. The DUP, which is propping Mrs May up in power. welcomed her assurances on the Northern Ireland border issue, saying she was 'standing up' for the UK's interests. Tory MP Jacob Rees-Mogg, who chairs the Brexiteer European Research Group, (ERG) praised the PM's 'strong and forthright' speech - but urged her to revert to pushing for a Canada-style deal. He said: 'The EU is not acting in good faith. This makes the Prime Minister's task harder and she is right to remind them that no deal is better than a bad deal. 'The Prime Minister is also right to protect the rights of people from EU member states living in this country regardless of whether there is a deal. 'Likewise her determination not to erect barriers between Northern Ireland and the Irish Republic is sensible and something many have previously suggested. 'However, there is still no reason to suppose that Chequers can work either for the UK or the EU. Scottish First Minister Nicola Sturgeon described Mrs May on the Brexit negotiations as 'dreadful' as she branded the Chequers proposals a 'dead duck'. Mrs Sturgeon said a no deal or 'no detail' Brexit was not acceptable following the Prime Minister's update. She said: 'The Prime Minister's statement was dreadful. The EU's view of the Chequers plan was bluntly and clearly expressed in Salzburg yesterday, but should not have come as a surprise to the UK Government, given that it was not a new position. 'Clearly, the Prime Minister has not been listening - Chequers is a dead duck but if her tactic now is to try and double down on those proposals and then seek to blame the EU for a no deal outcome, then she will do huge damage to all of those she is supposed to serve. 'What the latest development shows more clearly than ever is that the only remotely workable way for Brexit to happen is for the UK to stay in the single market and customs union. The European Union and its leaders fully respect the UK’s decision expressed in the referendum on leaving the EU. From the very beginning of the negotiations we have been focused on finding a deal that will minimise the damage resulting from Brexit. Also important to us is to create the best possible relations between the EU and the UK in the future. We studied the Chequers proposals in all seriousness. The results of our analysis have been known to the British side in every detail for many weeks. After intensive consultations with Member States, we decided that for the good of the negotiations, and out of respect for the efforts of PM May, we will treat the Chequers plan as a step in the right direction. In Salzburg, right before our meeting I said in a public statement: 'I would like to stress that some of Prime Minister May's proposals from Chequers indicate a positive evolution in the UK's approach as well as a will to minimise the negative effects of Brexit. The UK stance presented just before and during the Salzburg meeting was surprisingly tough and in fact uncompromising. The response of the EU27 leaders was to reiterate our trust in chief negotiator Michel Barnier and to reiterate our position on the integrity of the Single Market and the Irish backstop. While understanding the logic of the negotiations, I remain convinced that a compromise, good for all, is still possible. I say these words as a close friend of the UK and a true admirer of PM May. Scottish Tory leader Ruth Davidson also appealed for calm, urging critics of Mrs May's approach to 'shut up for a bit'. 'Of course it is concerning that we are still in a place where it is not clear to everybody what is going to happen and when and how it is going to happen. But I still think there will be a deal,' she told an event in Edinburgh organised by the Times Scotland. 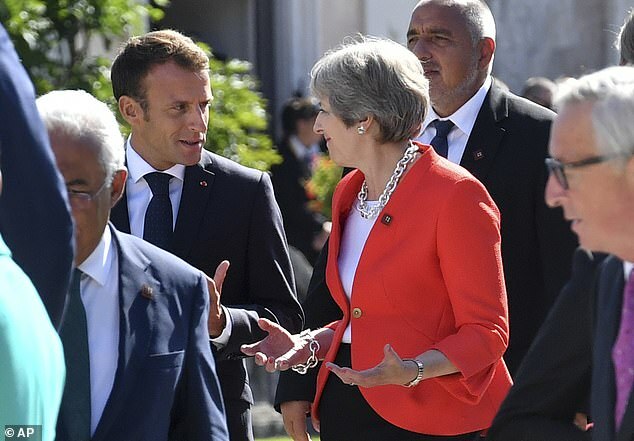 French president Emmanuel Macron sparked particular outrage when he gloated that turmoil in negotiations will teach Britons not to listen to 'liars' about how easy it would be to leave. In his press conference last night, Mr Macron said: 'Brexit is the choice of the British people and it is a choice pushed by certain people who predicted easy solutions,' he said in Salzburg,' he said. Jeremy Corbyn was mocked today after taking 24 hours to issue a response to the EU summit meltdown. The Labour leader did not comment on the row even though he found time to congratulate the winner of the Mercury Music prize. When the Labour leader finally did make a statement after Mrs May's Downing Street appearance this afternoon, he said her negotiating strategy had been a 'disaster'. 'The Tories have spent more time arguing among themselves than negotiating with the EU,' he said. 'From day one, the Prime Minister has looked incapable of delivering a good Brexit deal for Britain. 'Brexit has shown us one thing – and I fully respect British sovereignty in saying this – it has demonstrated that those who said you can easily do without Europe, that it will all go very well, that it is easy and there will be lots of money, are liars. 'This is all the more true because they left the next day, so they didn't have to manage it.' Mr Macron said it was true that Brexit negotiations had been complex and lengthy. His claim the leaders of the Brexit campaign 'left the next day' after the vote appeared to confuse them with David Cameron, who quit as PM after calling on voters to back Remain. By contrast, Brexit supporters David Davis, Boris Johnson and Liam Fox were brought into the Cabinet. 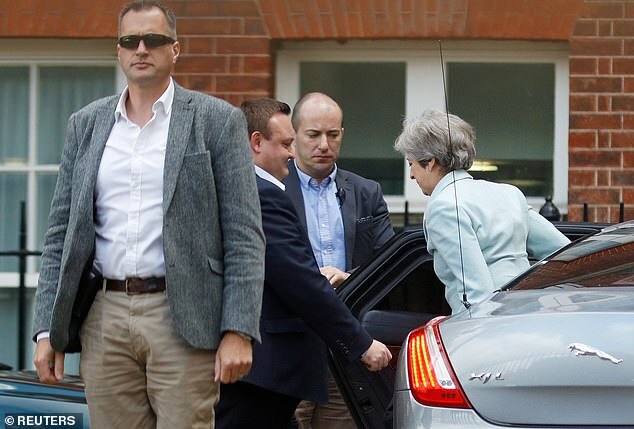 A visibly shaken Mrs May rounded on EU leaders for hanging her out to dry yesterday as she battled to keep her Chequers Brexit plan alive in the face of fierce Tory criticism. 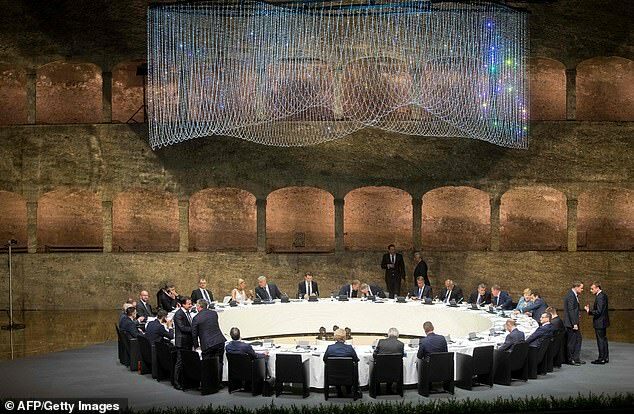 Mr Tusk said the other 27 leaders 'all agreed' that the complex plans at the heart of the Chequers deal 'will not work'. Communities Secretary James Brokenshire tried to soothe the tensions today, saying Mrs May was determined not to do the 'easy' thing by caving into EU demands. 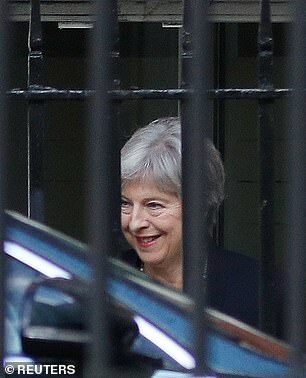 Mrs May arrived at the back entrance of No10 today after the bruising gathering in Salzburg'It is a negotiation. Should we be surprised that the EU has taken a tough stance at this stage in the negotiation?' he told BBC Radio 4's Today programme. Tory former minister Stephen Crabb, a Remainer in the referendum, voiced anger at the way they had tried to 'belittle' the PM. Critics of Theresa May's Brexit deal should 'shut up for a bit', Ruth Davidson said today. The Scottish Tory leader played down the PM's Brexit woes in Salzburg as she appealed for calm. 'Of course it is concerning that we are still in a place where it is not clear to everybody what is going to happen and when and how it is going to happen,' she told an event in Edinburgh organised by the Times Scotland. 'But I still think there will be a deal. 'The manner in which they sought to belittle and put down the Prime Minister yesterday pushes people like me... into a position where we say the quicker we're out of this circus, the better,' he said. Ex-Cabinet minister Iain Duncan Smith said the EU leaders had behaved 'appalling' and had 'got personal'. Mr Juncker seemed to accept that the attacks on Mrs May might have gone too far. He likened the bloc and Britain to 'two loving hedgehogs'. 'We have to be careful, like two loving hedgehogs,' Mr Juncker told Austrian newspapers. Jeremy Corbyn came under fire after taking 24 hours to issue a response to the summit meltdown - even though he had found time to congratulate the winner of the Mercury Music prize. When the Labour leader finally did make a statement after Mrs May's Downing Street appearance today he said her negotiating strategy had been a 'disaster'. How does Theresa May's Chequers deal compare with a Canada-style free trade deal? Britain would stick to EU rules on goods by adopting a 'Common rulebook' with Brussels, but in the services sector. Theresa May says this would allow the UK strike free trade deals globally, but the scope would be limited by commitments to the EU. The blueprint should minimise the need for extra checks at the borders - protecting the 'just in time' systems used by the car industry to import and export parts. The UK Parliament could choose to diverge from these EU rules over time. But there is an admission that this would 'have consequences'. Britain would set up something called a Facilitated Customs Arrangement. This would see the UK effectively act as the EU's taxman - using British officials to collect customs which would then be paid on to the bloc. The borders between the UK and EU will be treated as a 'combined customs territory'. The UK would apply domestic tariffs and trade policies for goods intended for the UK, but charge EU tariffs and their equivalents for goods which will end up heading into the EU. Mrs May says her plan will prevent a hard Irish border, and mean no divergence between Northern Ireland and mainland Britain. There would be no need for extra border checks, as tariffs on goods would be the same. Single market origin rules and regulations would also be sufficiently aligned to avoid infrastructure. Britain would strike a Canada-style free trade deal with the EU, meaning goods can flow both ways without tariffs. As it is a simple free trade deal, Britain would not be bound by the rules and red tape drawn up in Brussels. The arrangement would be a relatively clean break from the EU - but would fall far short of full access to the single market. Eurosceptics have suggested 'Canada plus' in key areas such as services and mutual recognition of standards. The UK would have broad scope to strike free trade deals around the world. Technology would be used to avoid extra customs checks on the borders. As a result goods travelling into the UK from the EU and vice versa would be tracked and customs paid without extra checks. The EU has suggested this is 'magical thinking'. The EU says the Canada model would mean border controls are required between Northern Ireland and the Republic to protect the single market and customs union. It insists Northern Ireland must stay in the bloc's customs jurisdiction in order to prevent that. Mrs May has signalled she agrees with the analysis - seemingly the reason she is reluctant to go down this route. But Brexiteers point out that there is already a tax border between the UK and Ireland, and say technology and trusted trader schemes can avoid the need for more infrastructure. Theresa May was hoping that the Salzburg summit could be the moment that her political fortunes changed. Downing Street went into the gathering with the expectation that EU leaders would, if not endorse, at least stop short of killing her Chequers plan. That would have allowed her to go into a potentially explosive Conservative Party conference at the end of this month with a modicum of wind in her sails. But in the event her compromise plan - pushed through at home at the cost of ministerial resignations and a simmering Tory mutiny - was brutally knifed by her counterparts. The meltdown has raised fresh doubts about whether Mrs May can survive much longer in No10, and brought the prospect of the UK crashing out of the bloc a step closer. Mrs May set the tone on the eve of the Salzburg meeting by writing an article in Die Welt. It warned the bloc against making 'unacceptable' demands on the Irish border, repeating her mantra that no UK PM could ever accept Northern Ireland being under a foreign customs jurisdiction. The combative piece is said to have infuriated leaders by effectively rejecting Michel Barnier's revised proposals on the border issue before they have even been published. Mr Barnier has said he is looking to 'improve' his plan, and suggested that technology could minimise checks. But he is still clear that the border should be between mainland Britain and Northern Ireland. EU leaders have been refusing to discuss Brexit directly with Mrs May all along - insisting that Mr Barnier is carrying out the negotiations for them. There had been hopes that this summit would be the first occasion when there would be exchanges on the issue at national leader level. 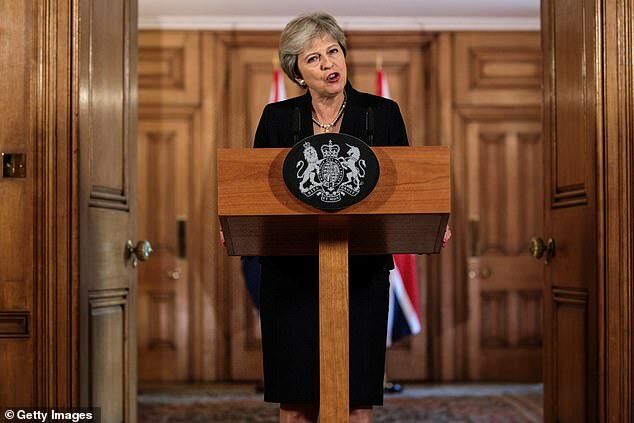 However, those hopes were dashed when EU council president Donald Tusk declared that Mrs May would only get to deliver a 10-minute speech at the end of dinner. By that time the leaders had already been through a scratchy four-hour debate on the migration crisis - a bigger concern than Brexit for many of them. And Mrs May caused frustration among her weary audience by effectively reading out the Die Welt article. 'That is not the way to command a tired group of leaders who are all bit sick of each other,' one diplomat told The Times. The situation was not helped by the emergence of a report that Trade Secretary Liam Fox was planning to slash food standards after Brexit to give the UK a competitive advantage and secure a US trade deal. Although furiously denied by Dr Fox, the claim seems to have gained traction with delegations from EU countries and encouraged them to take a tough line. One of the EU's overriding fears is that the UK cutting red tape and lowing taxes could provide an advantage for businesses after we leave. 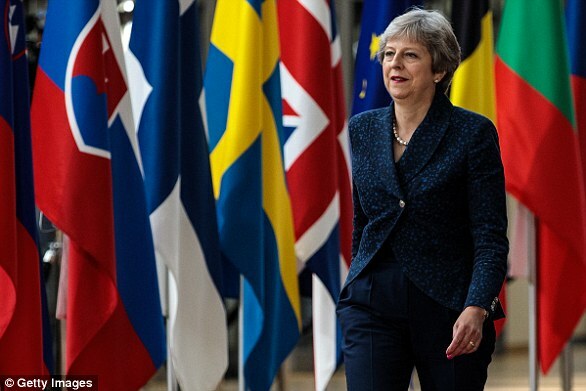 Britain's allies, such as the Netherlands, Sweden, Denmark and Poland, had been pushing for serious consideration of the Chequers blueprint. France and Germany, meanwhile, had been urging a less accommodating approach that preserved the strict rules of the single market. 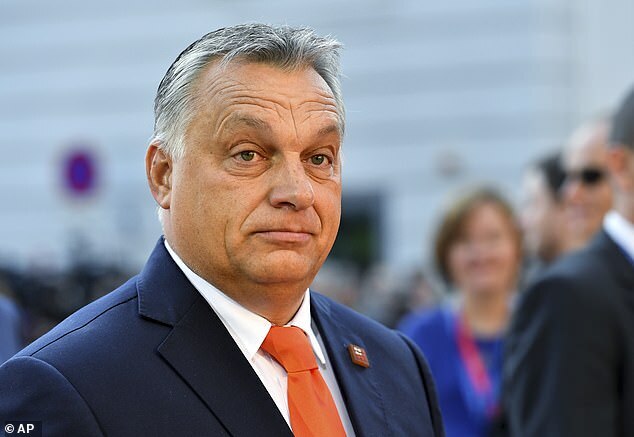 But the advocates for a deeper relationship seem to have been muted somewhat by the strident intervention of Hungarian premier Viktor Orban. He condemned the determination of some EU leaders to 'punish' the UK for choosing to leave. However, Mr Orban is currently viewed as a pariah by other leaders after pushing the country to the political right. The EU had been expecting Britain to come forward with its own plans for the Irish border 'backstop' - the big sticking point in sealing the divorce package. But having flatly rejected the EU's thinking, Mrs May is then said to have delivered a difficult message in a meeting with Irish PM Leo Varadkar yesterday morning. She apparently admitted that the UK's rival 'backstop' blueprint would not be ready for the next EU summit in October. The news caused anger as there had been lingering hopes that summit would see the Withdrawal Agreement to all intents and purposes settled. That is said to have tipped the scales against Mrs May, raising questions about whether the UK was serious about negotiations. After discussing the situation in private for two hours, the hard-line French and German approach won out and the brutal attack on Chequers was launched. After the Salzburg summit meltdown, the coming month of detailed talks will be among the most crucial so far. The UK and EU negotiators are scrambling to break the deadlock so they can frame a 'political declaration' on the future relationship and finalise the withdrawal treaty. How far they get in drafting the documents - and how much is left to EU leaders themselves - will determine when, if at all, an agreement can be struck. The political declaration will explain in non-legal language what the two sides plans to agree in the final treaty. A political declaration was used in December 2017 to outline the proposed transition deal and the £39billion divorce bill agreed by the UK. This is what is currently being turned into legal language for the withdrawal treaty. October's EU summit has long been pencilled in as the opportunity for EU leaders to agree the withdrawal treaty on the terms of exit and a political declaration on the future relationship between the UK and EU. If a deal can be struck in October, it leaves plenty of time for it to be agreed in the UK and ratified in the EU, paving the way for an orderly Brexit in March. A deal is not expected to be finalised at this summit but both sides will hope for significant progress - even if the summit is used to set out the dividing lines one last time. An emergency summit in November is now widely expected. If it happens, there will be acute political pressure to finalise both the withdrawal treaty and political declaration - if nothing else to allow the EU to return to other business. Expect a high stakes meeting and a late night finish. Failure will see both sides walking up to the brink of a chaotic exit and peering over the edge. Given the need to ratify the deal, the December summit is the last chance to strike a deal. Brexit is not supposed to be on the agenda: if the talks reach this summit there has been a major breakdown. The EU does infamously find a way to agreement at the 11th hour and if Brexit talks are still live in December, many will hope for a fudge that can get both sides over the line. Last year, talks on the outline divorce deal were pushed to December and a deal was - just - reached. Assuming there is a withdrawal treaty and political declaration, the next stage is for the action is in the UK Parliament. Mrs May promised Tory Remain rebels a 'meaningful' vote on the final deal in both the Commons and Lords. This is expected to be a simple yes or no vote on what she has negotiated - so in theory a detailed withdrawal treaty, spelling out the divorce bill and other issues such as citizens' rights, and the political declaration on the future relationship. Linking the two will be a high stakes moment. Brexiteers do not want to sign off the divorce bill without a trade deal and Remainers are reluctant to vote for a blind Brexit. But the Prime Minister has made clear it is deal or no deal: accept what she has negotiated or leave Britain crashing out on March 29, 2019 with no agreement in place. If the meaningful vote is passed, there will be a series of further votes as the withdrawal treaty is written into British law. After the meaningful vote in the UK, the EU will have to ratify the agreement. This is a two stage process. National parliaments in all 27 countries have to vote on the deal. It does not need to pass everywhere but must be carried in at least 20 of the 27 countries, with Yes votes covering at least 65 per cent of the EU population. The European Parliament must also vote in favour of the deal. It has a representative in the talks, Guy Verhofstadt, who has repeatedly warned the deal must serve the EU's interests. In practice, once the leaders of the 27 member states have agreed a deal, ratification on the EU side should be assured. At 11pm on March 29, 2019, Britain will cease to be a member of the European Union, two years after triggering Article 50 and almost three years after the referendum. Exit happens at 11pm because it must happen on EU time. If the transition deal is in place, little will change immediately - people will travel in the same way as today and goods will cross the border normally. But Britain's MEPs will no longer sit in the European Parliament and British ministers will no longer take part in EU meetings. Negotiations will continue to turn the political agreement on the future partnership into legal text that will eventually become a second treaty. Both sides will build new customs and immigration controls in line with what this says. 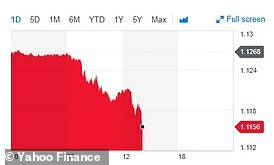 The pound slumped against the world's major currencies this afternoon as investors bet that the UK is set to crash out of the European Union without a deal after Theresa May revealed the extent of the 'impasse' at the Salzburg negotiation. The Prime Minister hit out at her counterparts for lacking 'respect' as she vowed defiance despite being brutally ambushed at the summit when counterparts condemned her Chequers plan. Continuing a rollercoaster week, sterling fell by 1.5 per cent against the the dollar to $1.307, and versus the euro it fell by 1.2 per cent to €1.110. Against the euro the pound fell by a cent to €1.110.